Happy Saturday! I am not going to post how many days left until Christmas break because it freaks me out. I am ready for the break (really ready!) but I am not actually ready for Christmas and the 100 things I need to get done before the big day. So instead I will focus on what I have been doing in my classroom to try and keep us focussed on spreading Christmas joy and happiness. First of all I was inspired to start this program after reading this amazing post from Erica at Erica's Ed-ventures. 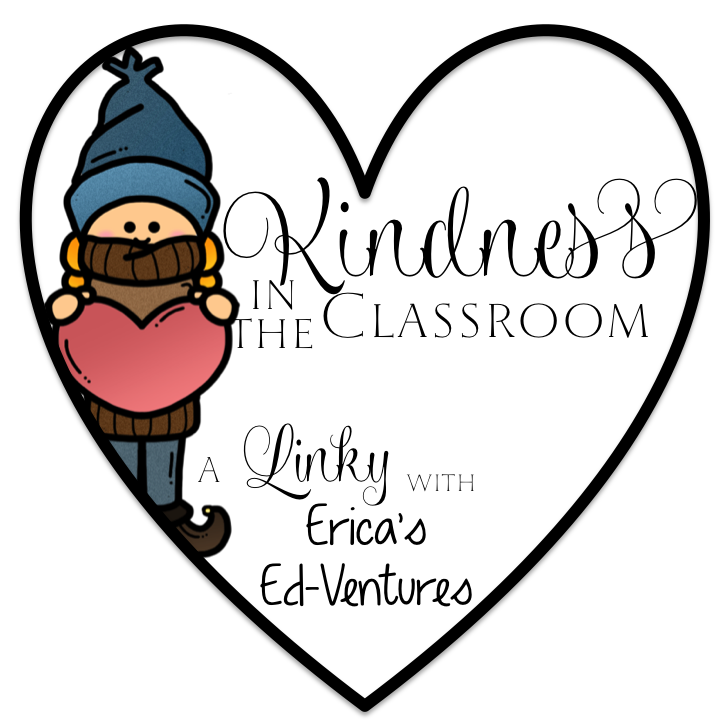 You really need to read her post on how she is using kindness elves in her classroom (she even includes some freebies). So, after reading her post I thought I am totally going to do that!! And I kept thinking that until Sunday night when I finally found a minute to run out to a few stores looking for some elves to use (not THE elf - just some cute elves). Alas, when you wait till Sunday night at 8:00 p.m. you are not always successful. BUT I did have a few Christmas stuffies at home - and in the pile of stuffies I found some reindeer and the Kind-"deer" was born. I took the ideas shared by Erica and changed the elf to a reindeer. Here is what we are doing. On Monday the Kind-deer showed up in our room. He had a note for our class introducing himself. 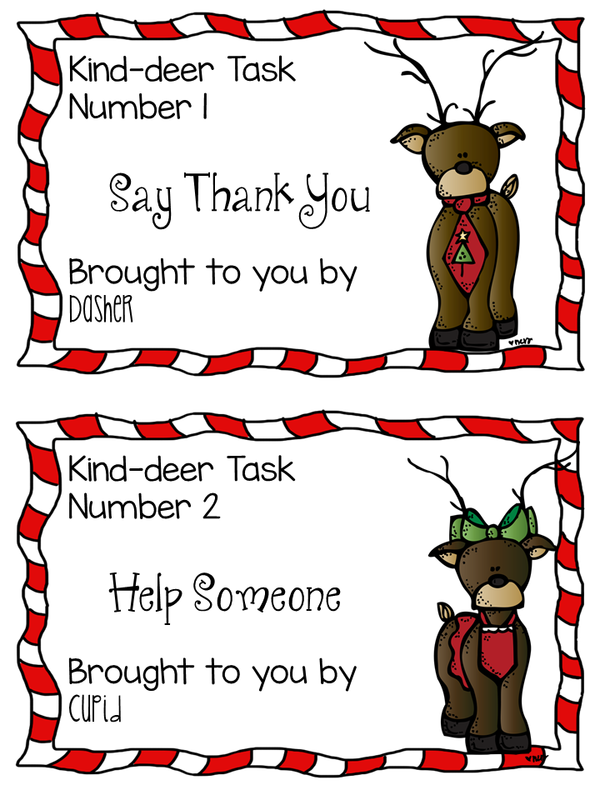 Each day a reindeer drops off a note giving us a kindness challenge. At the end of the day, students get a sticker for their countdown calendar. The students are loving it!!! We have said thank you, spread smiles, shared sweets (candy canes), made cards and helped others. Those are the stickers we add to our countdown calendars. On send a smile day my teaching partner brought in smiley face balloons for our classrooms. Next week we will have a few notes from elves too (there are only so many reindeer!!). If you are interested in having a kind-deer visit your classroom - you can click here to pick up the kindness notes we have been using. The file includes Give a Gift - we will be giving pencils and erasers to others. It also includes a few empty cards for you to make your own. I am using Avery circle labels to make stickers for our countdown calendar (I got this one free online). Each day they complete the kindness task they get a matching sticker for their calendar. On Friday we made the window reindeer craft (cause I love it!!). We added some math - about what shapes we used. We also added some writing - if the kind-deer looked in our window how would he see us being kind. The writing template is part of the note file. I am linking up with Erica at Ed-ventures - since this is really her idea with a change of clipart! I am also linking up with my friend Joanne at Head Over Heels for Teaching since our Kind-deer is definitely motivating my students to spread Christmas joy and happiness (in between the I wants and can I haves!!). No, seriously, the students, love coming in to see the note each morning and hear what we need to do. They also love sharing with me how they met the challenge at the end of each day. Your window reindeer are great. I can just all the classroom windows covered by peering reindeer! I have read several blogs on giving/receiving in the past few weeks and have gotten ideas from each. I like the way your Kind-deer drops in every day instead of it just being a one day list and move on activity. My second favorite idea came from http://monthbymonth.scholastic.com/organize.html. It was the Great Thank You Gifts blog on that page that also stretched the good feelings, good teaching over all the pre-holiday school days. I think that with Kind-deer looking over their shoulders and plenty of stuff to make gifts with my students will be full of wonderful thoughts well into the future. How sweet is the kind-deer? I love it! Spreading kindness is so contagious this time of year! I too am teaching my students to be better citizens and to participate in random acts of kindness. What a great way to end the year before Christmas break! Thanks for linking up my friend! Such a fun and timely idea!! I can definitely use this in my classroom. Amazon...here I come!